Max Swisher invented the ZTR mower way back in he day. In fact, legend has it Mr. Swisher invented the first automatic mower in the day of his youth. Legend has it Max fastened a rope to a tree in the middle of his yard, and the other end was attached to a self propelled mower. As the mower went around and around the tree, it cut ever smaller circles in the grass. It was a far cry form today’s automatic robotic mowers, but you have to give Max credit for allowing his creativity to support his laziness. Swisher went forward with other inventions, to include creating the first riding lawn mower. Over time, his products garnered quite a following. Today, Swisher makes a quality mower which has earned a loyal customer following. All the Swisher ZTR mowers feature side discharge. The deck cutting height is adjusted manually using a lever. The PTO is electric on all the models. The frames on all the Swisher ZTR models is fully welded steel ( no bolts and nuts to come loose, compromising the frame strength). Swisher ZTR mowers are available in 5 model series - the Swisher; Ride King; Z-Max; Big Mow, and Pro-Series. All have Dual Eaton hydrostatic units on each drive wheel. The Big Mow and Pro-Series are equipped with larger engines and cutting decks. Some models of Swisher ZTR mowers are sold through Sears. The Swisher Series (model ZT2450A and ZT2454) offers a choice between two models, the ZT2450A and the ZT2454. Both models are powered by the 24 HP Briggs and Stratton twin cylinder engine. This engine features a pressurized oil system, with a replaceable oil filter. The lap bars controlling speed and direction are padded. An Eaton commercial grade hydrostatic transmission powers each drive wheel. The cutting deck is either 50” or 54”, depending on the model. Both feature triple “Gator Mulcher” blades, which turn under a stamped steel deck. The seat is a mid back high seat with armrests as a standard feature. The Ride King (model ZT2452) comes with a 52” triple blade cutting deck which is stamped steel, and is equipped with the 24 HP Briggs and Stratton twin cylinder engine. This engine features a pressurized oil system, with a replaceable oil filter. The lap bars controlling speed and direction are padded. The standard Eaton commercial grade hydrostatic transmission powers each drive wheel. The seat is a mid back high seat with armrests as a standard feature. The Z-Max (model ZT2660B) comes with a 60” triple blade cutting deck which is stamped steel, and is equipped with the more powerful 26 HP Briggs and Stratton twin cylinder engine. The lap bars controlling speed and direction are padded. The standard Eaton commercial grade hydrostatic transmission powers each drive wheel. The seat is a deluxe 16” high-back, with armrests as a standard feature. The deck height is adjusted using a spring assisted hand lever. 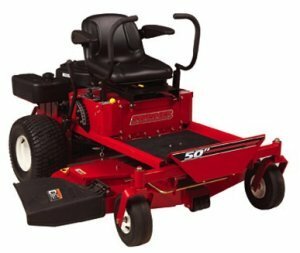 The Big Mow (model ZT2766) comes with a 66” triple blade cutting deck which is stamped steel, and is equipped with the 27 HP Briggs and Stratton twin cylinder engine. This engine also features the pressurized oil system, with a replaceable oil filter. The lap bars controlling speed and direction are padded. The standard Eaton commercial grade hydrostatic transmission powers each drive wheel. How about a deluxe 16” high back seat and arm rests? With that generous cutting deck width, don’t expect to sit in the seat long enough to develop fatigue. The Pro-Series (model ZT2766KP) comes with a 66” triple blade cutting deck. As with all the Swisher mowers, it is made of stamped steel. A 27 HP Kohler Courage twin cylinder overhead valve (OHV) engine makes the wheels go. This engine also features the pressurized oil system, with a replaceable oil filter. The lap bars controlling speed and direction are padded. The standard Eaton commercial grade hydrostatic transmission comes standard. The 16” high back seat has added features of full suspension and lumbar support. This machine would make short work of any sized yard. The Swisher company makes a quality product for the homeowner, that should be attractively priced. Contact your local dealer for current rates.